There are few classic dishes which are more filling, more convenient and easier to make than Oil Down - aka the food of the gods. 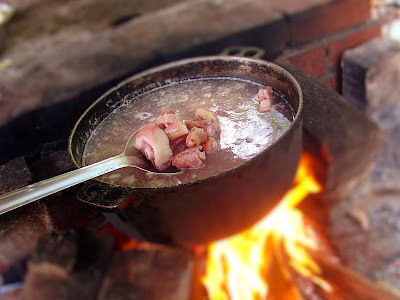 Its the perfect meal to plan, when you intend to be in the middle of the Caroni swamp with just one pot and a campfire, and not sure if the fish will be biting. The way this version is made may be slightly different from the norm, but the first rule in bachelor type cooking is to bend the rules, so lets go. 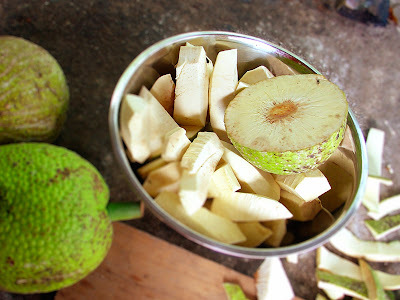 Cut up your yellow variety breadfruit into two inch cubes. Cover in water until you're ready for it, since it oxidizes real fast. 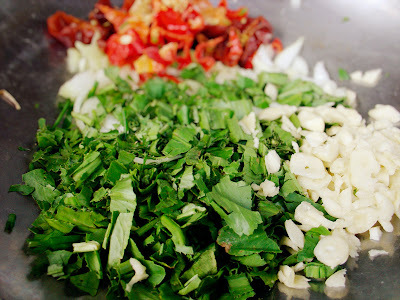 Roughly chop up your seasonings of choice, I used the old basics, chadon beni, chives, onion, garlic, and a few hot peppers (1/4 of one would work for non pepper eaters). I forgot to bring the thyme, which is excellent in oil down. 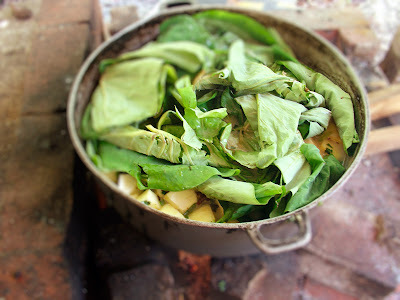 Boil your pig tail for about 1/2 hour or so and drain. Into your cast iron pot add some oil and a little onion, garlic and hot pepper and fry till it just begins to brown. Add the pigtail and stir fry for a few minutes. 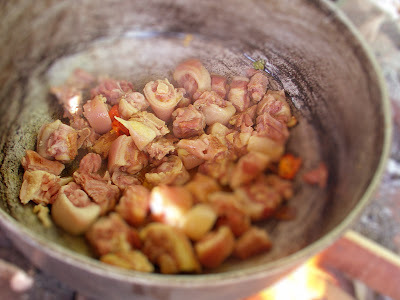 Once the pig tail is hot and happy, add the remaining seasoning and the breadfruit and stir to distribute the seasonings. 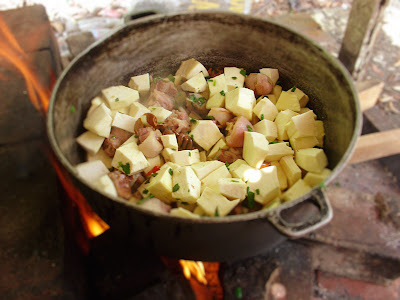 Pour the coconut milk into your pot, add water until it almost covers the breadfruit. 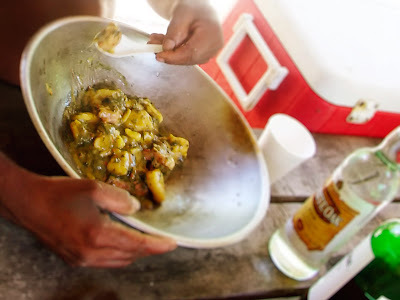 Use the milk of one coconut per breadfruit. One thing I always add to oil down is dasheen bush leaves -not the stalks though. Put them in whole at the top, and cover the pot. At this juncture you can add stuff like carrots, plantains cassava etc if you like, however I don't do that. 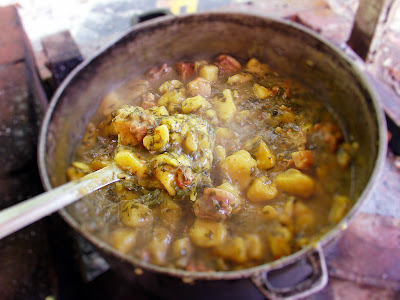 Cook until breadfruit is done, stirring occasionally. About 10 minutes before its finished, add your trusty golden ray, and check the salt. Stir and cover till done. Since we neglected to bring dishes, the oil down had to be enjoyed from a basin, which turned out to be quite practical. There you go, the food of the gods... well, most of the gods.